Wooden hammer and tool handles never last forever, and though replacement is inevitable, you probably won’t find a professional offering this service anywhere. That makes handle replacement a DIY job, and it’s one you can probably handle easily. 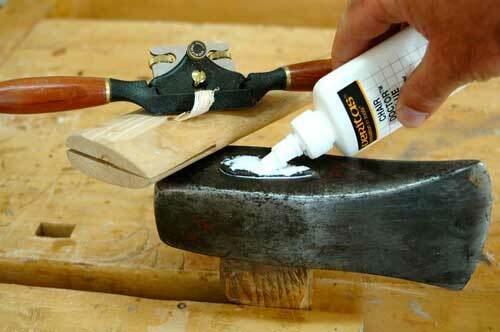 The process is the same for all wooden-handled tools, and it begins by getting the old handle out. Drilling is the way to start. Put a 5/16” to 3/8” diameter twist bit into your drill, tighten the hammer or axe head in a bench vise (with the handle pointing down), then chew out as much wood as you can from within the hole in the head. The more you drill, the easier the old handle comes out. You’ll probably find metal wedges embedded in the end of the handle somewhere (installed originally to expand the wood), but that’s no problem. Just bore holes next to them, then pry the wedges out for use later. Even after drilling, you’ll probably have to resort to a hammer and short chunk of broom handle to get all the old handle out. If pounding doesn’t work, drill more. You always have to whittle down new handles to fit in hammer and axe heads, but you mustn’t remove too much wood. You want as tight a fit as you can, and here’s how to get it. Pounding: Hold the axe or tool head on the end of your new tool handle as it stands 6 inches off a hard floor, then pick the whole thing up and slam the end of the handle down on the floor with moderate muscle three or four times. This drives the head down over the end of the handle a bit, and though the head won’t get very far, it will make marks on the handle to guide you. Wiggle the head off and look at the wood. Wherever you see the end of the handle has been rubbed or compressed by the head, use a pocket knife or a spokeshave to whittle down the handle in this area. Never heard of a spokeshave? 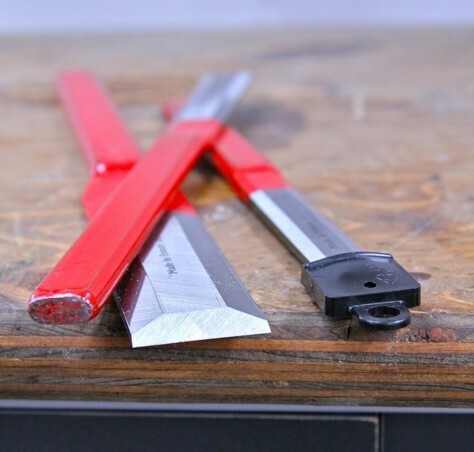 It’s a small, safe, hand-held woodworking tool that’s useful for all kinds of shaping jobs. Every time you repeat the pounding and head removal, it creates new areas of compression that shows where whittling’s necessary. Whittling: Pound, remove the head and whittle away the excess wood. With every repeated cycle the head will go a little further down the handle before refusing to go further. Continue until the wood of the handle extends about 1/4” above the end of the tool head, then stop. Now you’re ready for the next step. Wedging: Use a hammer to pound a softwood wedge into the factory-cut slot in the end of the handle to expand it. You can buy these wedges in plastic packages wherever replacement tool handles are sold. When the wedges won’t go in any further, saw all excess wood off so 1/8” extends beyond the head. Finish up by driving one or two of the metal wedges you saved into the wood at the end of the handle at a 45º angle to the wooden wedge. This expands the new handle even more, locking the head very firmly in place. At this stage the tool is ready to work with, but I do something extra. Just to make sure the handle and head stay connected for as long as possible, I apply some wood swelling liquid to the top end of the handle This expands the fibers, locks them this way, then seals the surface to prevent water absorption. Water on wood handles is bad because it causes the wood to swell, compressing the fibers and leaving a looser handle when the wood inevitably dries out. At the first sign of a wooden tool handle coming loose, apply some swelling liquid and it’ll tighten right up and stay that way.